A Washington Post fact checker analyzed Sen. Claire McCaskill's (D., Mo.) comments on Tuesday that the Republican tax reform law will not benefit the majority of people in the long run, and ruled that the claim contained "significant omissions and/or exaggerations." The analysis looks at whether the Trump tax cuts made in the recently passed tax bill would be good or bad for the middle class. 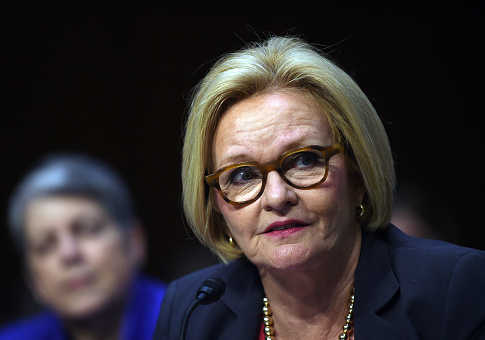 It ultimately assigned McCaskill's claims "two pinocchios," meaning they contained "significant omissions and/or exaggerations" to "create a false, misleading impression." McCaskill was quoted in a Tuesday HuffPost article saying the GOP tax law will "make rich people richer" and that "in the long run is not going to be helpful to the cast majority of people in my state." "It’s a debt-inducing, make-rich-people-richer tax bill that in the long run is not going to be helpful to the vast majority of people in my state that are sitting around the kitchen table trying to figure out how [to] come out even at the end of the month," McCaskill said. The fact checkers at the Post determined McCaskill "slipped" when she used the phrase "in the long run," because she realizes the immediate benefits the tax law will give to middle class families. It is true that individual tax cuts will expire over the course of a decade, but the expiration was seen as a necessary, temporary step for Republicans to keep the whole tax cut within a budget of $1.5 trillion over the next ten years. However, it would be possible to extend individual tax cuts before they expire. Moreover, it is assumed Congress would vote in favor of doing so when the time comes in the same way the tax cuts from George W. Bush’s presidency were extended under former President Barack Obama. McCaskill’s office declined to comment on whether she would support the extension of tax cuts for individuals provided in the new tax law. Instead of focusing on the short-term, McCaskill has focused her opinion of the tax law on what might happen in 2027, when the individual tax cuts begin to expire. Even though the vast majority of Missourians will experience tax cuts in 2019, without an extension, almost a third would see their taxes increase in 2027, according to a report from the left-leaning Institute on Taxation and Economic Policy. "In the middle 20 percent of households, 90 percent would get an average tax cut of $830 in 2019–compared to 60 percent getting an average tax cut of $100 in 2027, or about a quarter a day," the Post noted. Essentially, the Post argues, there are two very different ways to look at the tax bill: in respect to short term or long term benefits. Republicans focus on the more immediate tax cuts to every income group, while Democrats have chosen to focus on the ugly-looking long-term distributional tables for 2027. The Post concludes the biggest problem with McCaskill’s comments is she only tells half the story. This entry was posted in Politics and tagged Claire McCaskill, Washington Post. Bookmark the permalink.